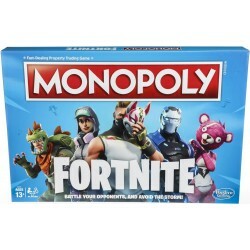 To start Monopoly: Fortnite, choose a character, picking from 27 outfits. Then, it's time to battle. The action die lets players pick up health packs, build walls, and damage their opponents. Every time a player passes Go, they unleash the Storm — avoid it or lose HP. As in the Fortnite video game, the last player standing wins!